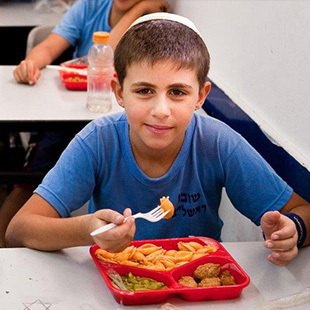 In its school system, Shuvu offers immigrant and native children high-level secular and Jewish studies programs, with a long school day, hot nutritious lunches, and plenty of individual attention. 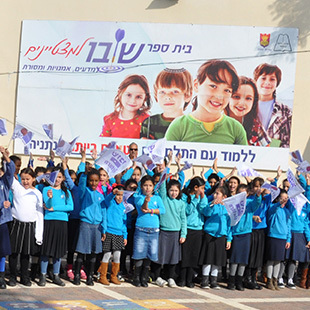 The network is comprised of kindergartens, elementary schools, junior high schools, high-schools and after school programs, spanning the length and breadth of Israel – from Be'erSheva down South to Akko up North – touching the lives of many thousands of children on a daily basis. Return/Shuvu provides some 4,100 students with a hot lunch daily (in many towns in conjunction with the municipalities). In order for its students to properly concentrate and maximize their studies, they are in need of a good, nutritious lunch during the long school day. The majority of Shuvu students come from impoverished homes and many are of single parent homes. Often the hot meal received at the school is the only nutritious meal the children receive all day. Unlike public schools which attract the local children of the neighborhood, Shuvu schools attract students from the entire city. 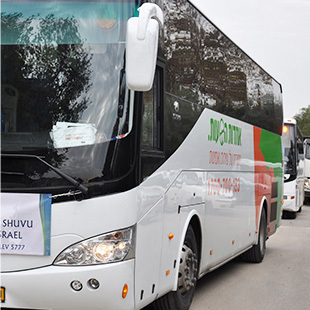 Thus Shuvu arranges daily transportation for its thousands of students to get to school and back home. 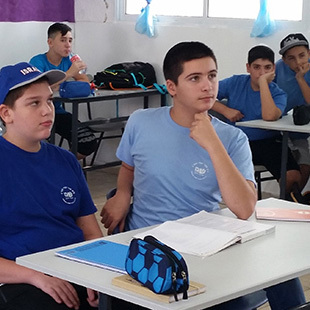 Shuvu schools throughout Israel offer a unique curriculum designed to provide each of its students with the skills they will need to succeed in today's Israeli market. The curriculum emphasizes mathematics, physics and computer programming, and within our junior high schools and high schools even a most unique program of Cyber Studies and Financial Studies. 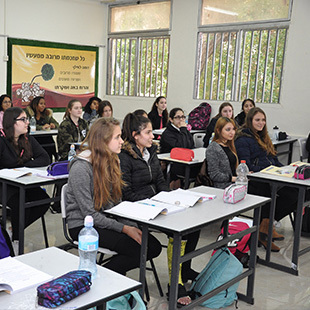 Mathematics: Public high schools in Israel provide 4-5 weekly hours of mathematics taught by teachers with bachelor's degrees. Shuvu's high school program provides 6-7 weekly hours of mathematics, with approximately half of the students taking advanced-level classes. Physics: Many public high schools do not offer physics as a subject. Only 8 percent of students nationwide take final examinations in this subject. In contrast, some 70 percent of Shuvu's tenth graders, and 50 percent of eleventh graders, study physics and pass final examinations. Computer Programming: Public high schools offer computer programming as an optional subject, with 4-5 hours of instruction per week. Shuvu's high school program offers 8 hours per week, taught by teachers who have been working as computer programmers for years. Students are taught the latest in programming languages and graphics in state of the art computer laboratories. Waterford Computerized Program: Developed in the USA over the course of 10 years at a cost of over $100,000,000, the Waterford Program serves as a tool for children to self-master English on the level of a mother-tongue and also attain a high level of mathematics and sciences. This major enterprise and educational tool is designed to teach English as a second language - not only focusing on vocabulary and grammar, but on correct dialect as well. It is also designed to teach sciences and mathematics, while having the instruction performed in English as well. Waterford is currently being used in various countries around the world and Shuvu is proud to have been chosen to be the pilot in Israel. As of today Shuvu is the only educational system in the country teaching with this program. Over the years Shuvu has introduced this program into many of its schools, and teachers, students and parents alike are all amazed by the children's developments. So much so, that parents report that it serves as a draw when choosing a school for their children. In order to utilize this program, a laboratory classroom is used consisting of 30 computers. During at least one hour a week the complete class spends the period in the laboratory. Each child sits next to one of the computers and uses advanced headsets while enjoying his own private tutelage. The personal development of each child is monitored allowing him to continue the next session exactly where he left off and progress at his own individual pace. Cyber studies: Starting from 7th grade, Shuvu providesan extensive comprehensive course to become experts in the upcoming field of "Cyber". They are taught the many aspects of this field to ultimately become leading professionals serving both their country (through the IDF cyber forces), and to also excel in their civilian lives with great employment opportunities. This exciting program is approved by the Ministry of Education and will give credit towards a High School Diploma. Financial Studies: This 2 year course is given over 7th and 8th grades. The children receive a course which provides them with the knowledge and tools to run their financial lives. They are taught about budgeting, banking, interest rates, being a wise consumer, credit and debit cards, and more. In order to strengthen the effect of this financial education, the parents of the school too are invited twice a year for a financial education session of their own. In an effort to prevent thousands of children from having to spend the better part of their day at home unsupervised while their parents or guardians struggle to earn a livelihood, Shuvu runs after-school programs for the children in its school network. The children are kept off the streets by instead participating in a wide range of educational and entertaining activities, including computers, arts and crafts, music and English as a second language. 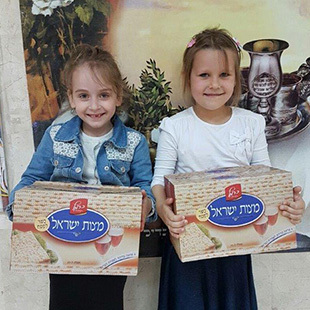 Annually Shuvu/Return distributes thousands of Passover packages to the students and their families, containing Matza, wine, grape juice and other holiday essentials. Without Shuvu/Return supplying these, the parents either due to financial restraint or lack of understanding simply would not purchase these items. Thanks to Shuvu's Kimcha D'Pischa program, the families are able to eat Kosher LePesach food over the Chag and celebrate joyously. 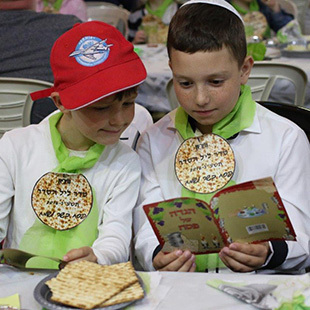 Shuvu/Return organizes Community Seders on Pesach night in several locations throughout Israel. These are in addition to the "Model Seders" run in all Shuvu schools before Pesach, to demonstrate to the students how a Seder is to be conducted. Instead of the norm where parents' answer their children's questions about the Exodus, at Shuvu/Return it is the children who are equipped with the knowledge to answer the parents' questions. For two working parents, their child's two-month summer vacation presents a very serious dilemma. They either need to pay an exorbitant sum to enroll their child in a summer program, or their child is left to roam the streets on his own. Shuvu/Return offers disadvantaged immigrant children an unforgettable camping experience that keeps them off the streets and away from drugs and violence. 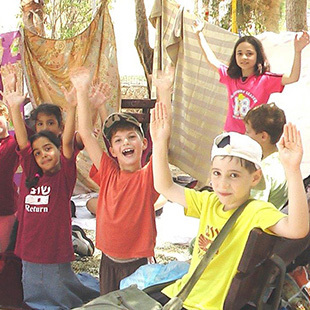 The program provides these children with a warm, caring and atmosphere of Jewish values where they not only participate in wide range of activities, but also learn, grow, and just have fun.